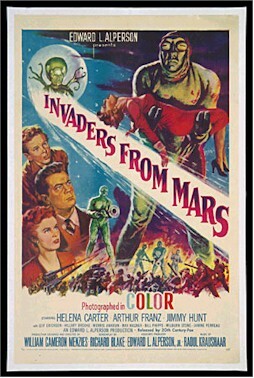 "Invaders from Mars" - This 1953 film's director, William Cameron Menzies, was no stranger to the science fiction genre, having long before directed the visionary H. G. Wells adaptation, Things to Come (1936), and before that the 1924 Doug Fairbanks fantasy classic, The Thief of Baghdad. Invaders from Mars would be one of the final two films that the respected director would finish, and his unique vision permeates this one as much as any other. German Expressionist settings and touches flows through the film's major scenes, and the main message of the film is unusual for the age of McCarthyism: conformity is not necessarily a good thingsometimes it can be fatal. While haunted by the technical faults that plague low-budget films, Invaders from Mars stands up as a quality effort. This 27" x 41" one-sheet poster is from the 1955 re-release for Menzies' film. It glowingly displays as a Mint gem, linen-backed for preservation and presentation (sealing a few small and inconspicuous edge tears), with only the most minute of color touches in a few fold lines and a neat 1/2" professional repair to an edge tear. The graphics are as sensational as the director's vision! !